Surgery is always changing and the new technologies demands proper training before we can perform surgery in humans. Today it has become indispensable to retrain surgeons who are willing to embrace the new techniques. NOTES is becoming the new era in minimally invasive surgery, but it is a high demanding technique. 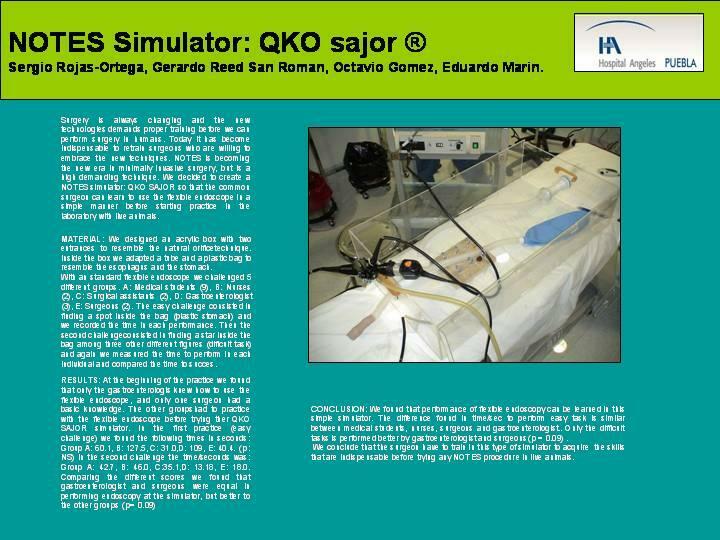 We decided to create a NOTES simulator: QKO SAJOR so that the common surgeon can learn to use the flexible endoscope in a simple manner before strating to practice in the laboratory with live animals. MATERIAL: We designed an acrylic box with two entrances to resemble the natural orifice technique. Inside the box we adapted a tube an a plastic bag to resemble the esophagus and the stomach. With an standard flexible endoscope we challenged 5 different groups. A: Medical students (9), B: Nurses (2), C: Surgical assistants (2), D: Gastroenterologist (3), E: Surgeons (2). The easy challenge consisted in finding a spot inside the bag (plastic stomach) and we recorded the time in each performance. Then the second challenge consisted in finding a star inside the bag between three other different figures (difficult task) and again we measurred the time to perform in each individual and compared the time to succces. CONCLUSION: We found that performance of flexible endoscopy can be learned in this simple simulator. The difference found in time/sec to perform the easy task is similar between medical students, nurses, surgeons and gastroenterologist. Only the difficult tasks is performed better by gastroenterologist and surgeons (p 0.09).. We conclude that the surgeon have to to train in this type of simulator to acquire skills that are indispensable before trying any NOTES procedure in live animals.